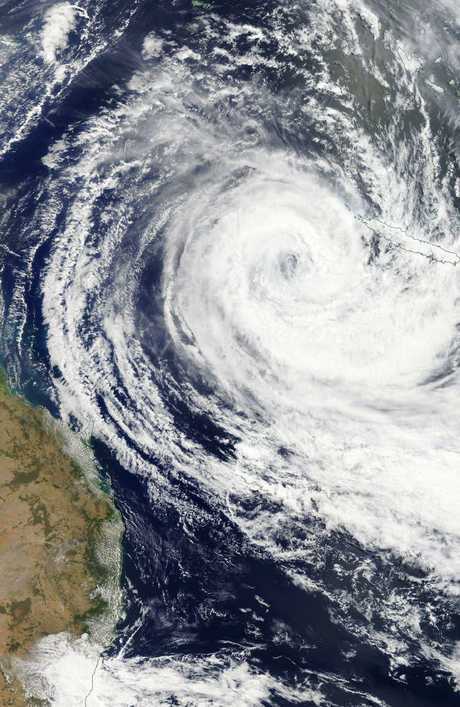 A Bureau of Meteorology radar image shows Cyclone Oma on Wednesday night on a path for southeast Queensland. 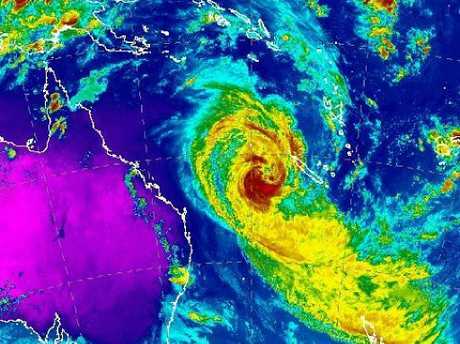 FEROCIOUS winds and gigantic waves expected to smash southeast Queensland and far northern New South Wales this weekend as Tropical Cyclone Oma heads towards Australia's east coast. The category two storm will bring large swells and king tides are expected to cause erosion, and communities from Bundaberg in Queensland south to Ballina in NSW have been issued a cyclone watch. 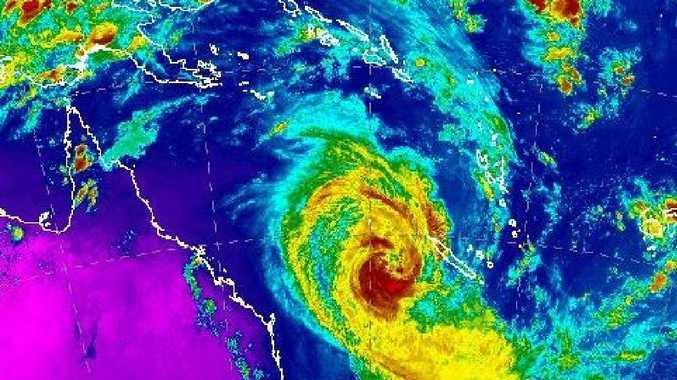 Late on Thursday, Oma was about 820km northeast of Brisbane, packing wind gusts of up to 130km/h. The storm system is likely to keep heading slowly towards southeast Queensland on Friday although it is not expected to cross the coast in the next few days. The cyclone could slow on Saturday and change course to a more north or northwest direction. 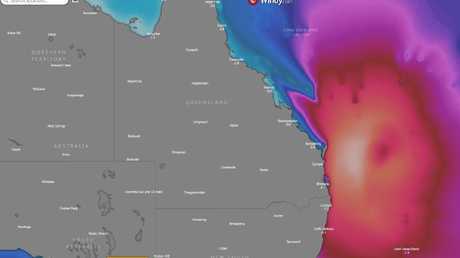 "Although Oma is not expected to make landfall in the coming days it will be close enough to produce direct impacts along the Queensland and NSW coast," the Bureau of Meteorology warned. "Gale force winds are expected to develop along exposed coastal areas of southern Queensland during Friday, well ahead of Oma, and may extend into coastal parts of northern NSW on Saturday." Water levels on the morning high tide may exceed the highest tide of the year by around one metre over the next few days. People in the cyclone watch zone have been urged to think about what preparations they might need to make if the cyclone threat increases. 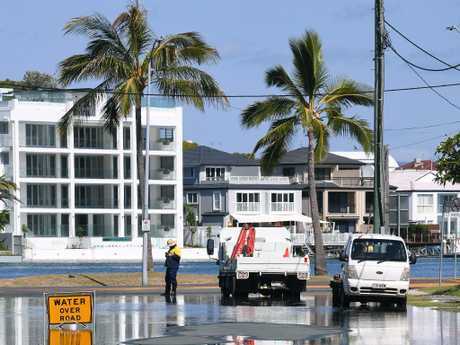 Gold Coast City Council have started providing sandbags to the community ahead of warnings of flooding, with the warning also including Brisbane and the Sunshine Coast. Surf Life Saving Queensland announced that all Gold Coast Beaches were closed yesterday morning as a result of the building swell. Queensland water police on Wednesday issued a warning to swimmers, fishers and boaters to stay out of waters and away from dangerous areas for "at least the next five days". 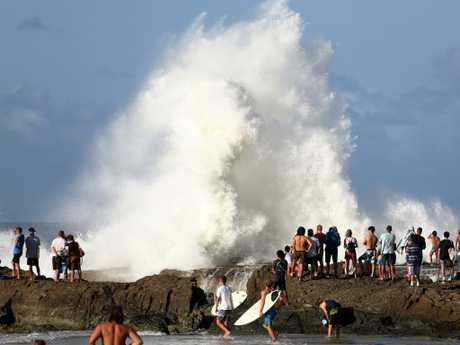 In Ballina and Byron Bay, residents were cautioned of rising tides, ocean swell and dangerous surf, with an abnormally high-tide warning issued for Ballina. A hazardous surf warning has been issued for Tweed Heads, Hastings Point, Byron Bay, Ballina and Brunswick Heads. Organisers are issuing sandbags at locations in Coomera, Tugun and Reedy Creek, with a 15 bag limit placed on each household, according to The Gold Coast Bulletin. 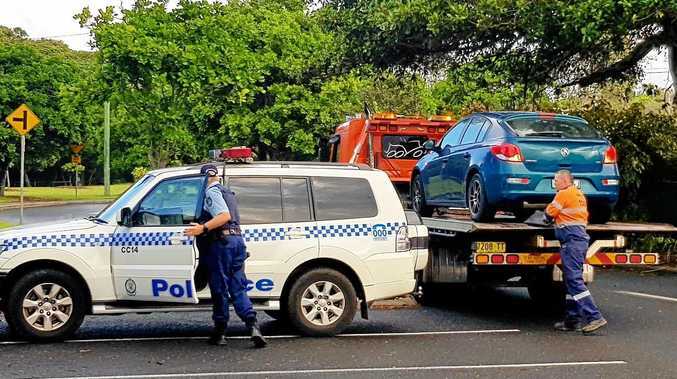 A Council spokeswoman said they hoped to help people prepare and didn't want to "start panic" as Cyclone Oma edges closer to the coast. Signage at distribution centres explains to residents how to use their allotted bags to prevent flooding. "Sandbags should be placed over floor wastes and drains … to prevent backflow of grey water entering," signage read. "Sandbags should also be used in front of doorways, roller doors and brickwork vents. "Before building a sandbag wall consideration should be given to how you would remove floodwater that could become trapped between the sandbag wall and your building." Brisbane City Council's depot was stocked with 57,000 sandbags according to the Lord Mayor Graham Quirk. These sandbags are available for collection at depots at Darra, Morningside, Newmarket SES Depot and the Zillmere-North Depot. Bureau of Meteorology senior forecaster Jonty Hall said Oma's behaviour was becoming unpredictable. The worst effects are expected to be gale-force winds, very high swells that could erode beaches, and heavy rain. "We are starting to see the main swell packet from Oma starting to arrive on the south coast of Queensland now," Mr Hall told the ABC. "That's likely to increase in the next couple of days." The Bureau yesterday warned that "dangerous surf conditions are forecast to develop about the east coast of Fraser Island and Wide Bay coast north of Bargara." "These conditions are then expected to extend south over the remaining southeastern Queensland coast during this evening and Friday. Beach erosion is likely to continue with the hazardous marine conditions." Weather prediction models currently suggest Oma will be 300km off the Sunshine Coast on Saturday, but for how long, and where it goes next is anyone's guess. The Courier Mail reported there were as many as 20 possible paths the cyclone could take. "The beaches will get beaten up and there will be rain and flooding, particularly south of Bundaberg," BoM forecaster Adam Blazak told the publication. "If it crosses the coast, we could see 500mm in some areas in one day, but it might head inland and help farmers,"
Authorities are warning people not to panic but to prepare themselves and their properties for a weekend of wild weather. A flood watch is in place for catchments from south of Gladstone to the New South Wales border. "The closer she comes to the coast, the more significant that rainfall will be and the further inland it will push," forecaster Lauren Pattie told the ABC. It is unusual, but not unprecedented, for cyclones to track as far south as Oma could eventually go. Mr Blazak said there was still uncertainty about which path the storm will ultimately take, but it could make landfall on the weekend. "A crossing is not certain yet, and there are scenarios where it may linger off the coast," he said. The weather system is already bringing hazardous surf conditions and abnormally high tides. The longer it stays offshore, the greater the potential damage to beaches as waves of up to six metres pound the shoreline, he said. Mr Blazak said it could also potentially bring much-needed rain to drought-affected inland areas of the southeast corner. "You don't really want a crossing," he said. "But that would be maybe a better scenario than if it lingers off the coast. It would end up decaying and dropping rainfall in those dry areas." As Oma makes its way south west, it enters the "Australian area of responsibility", according to Bureau meteorologist Jonathan How. The cyclone's sudden change of direction has amplified the risk. Mr How said residents of the affected areas could expected "very heavy rainfall, gale force winds and storm surges" and these conditions, along with abnormally high tides, could cause flooding. 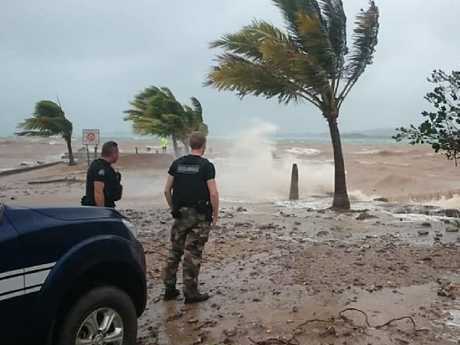 Queensland has not seen cyclonic conditions like this for some time, so Mr How said it was unclear how severe the effect of Cyclone Oma could be. 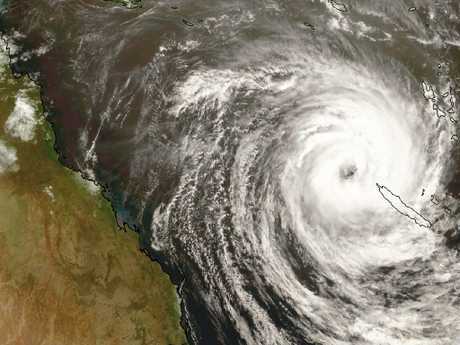 Forecasting images showed "the range of likely tracks of the cyclone centre" but this is "uncertainty associated with tropical cyclone forecasting", the Bureau website advises. "Due to the uncertainty in the future movement, the indicated winds will almost certainly extend to regions outside the rings on this map," it said.